The Microconic "W-type" over-grip collets work great for many parts that require over-grip in the sub spindle . They enable you to move operations from the main spindle to the sub-spindle. This balances the work being performed between the main and sub, which can dramatically reduce cycle time. When trying to hold parts like long bonescrews with wide pitch threads, or longer parts in general, there is a need for a longer grip land. 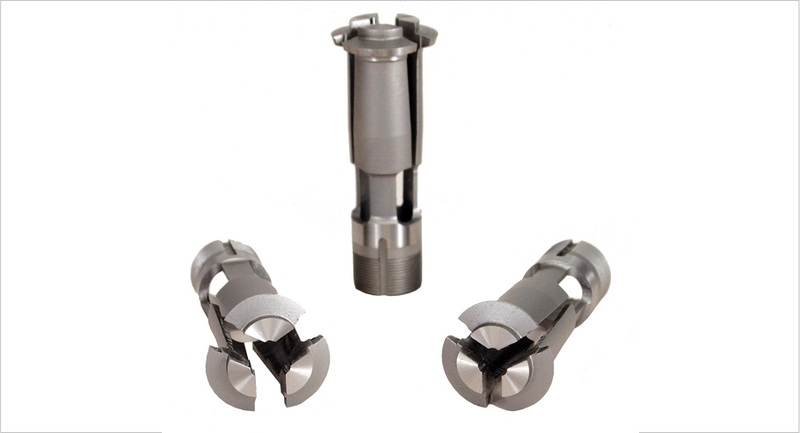 Our "T-type" over-grip collet has a longer gripping surface than our original W-type. The T-type is designed for applications such as this. 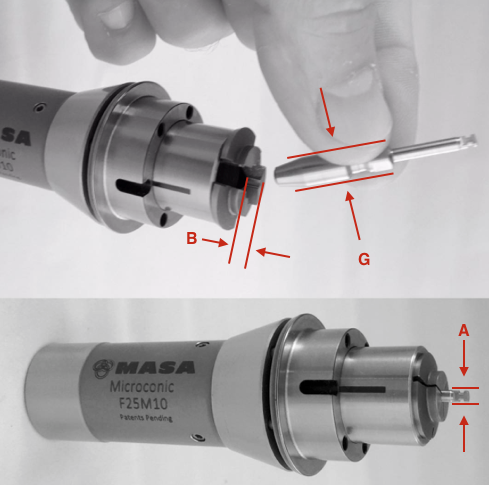 No other collet on the market can “overgrip” as much as the Microconic over-grip collet with the Masa Cartridge. The Microconic over-grip collets can open up to 3.5mm, 0.138" over the chucking diameter and run within 5 µm/.0002" TIR. Bone screws with wide-pitch threads. Orthopedic surgical drills and taps. Long, thin walled tubular parts. Over-grip collets, also referred to as over-the-shoulder collets, are used in a pick-off /sub-spindle when it is required to clear a shoulder and grip on a smaller diameter beyond the larger diameter. The surgical drill blank pictured at the left is a good example of this kind part. Extra spread is required to open the collet wide enough to go over the larger diameter. The grip diameter (A), the width of the grip land (B) and the largest part diameter to reach over (G) are required information to choose the off-the-shelf over-grip collet for your specific part. Microconic over-grip collets are a great way to expand your machine's capability, eliminate secondary operations and reduce cycle time. Standard gripping land length is 2x - 3x diameter. 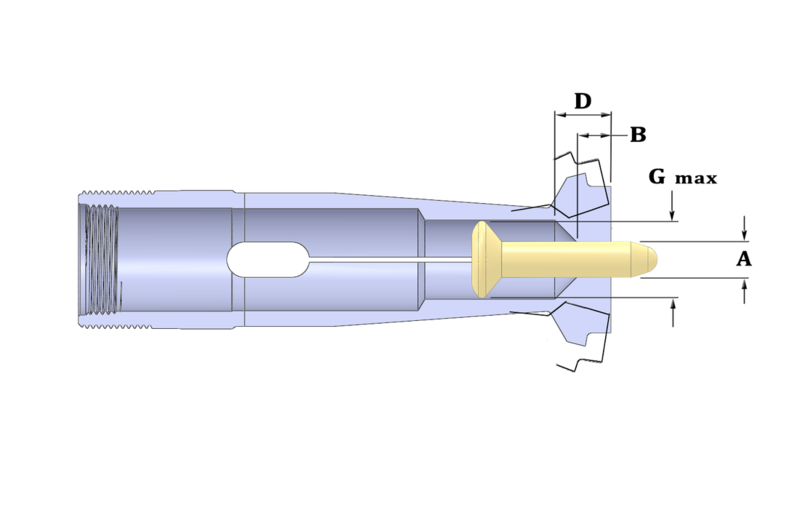 compared to the 1x diameter with W-type over-grip collets. Available from Ø1.55 - 7.2mm (Ø0.061" -0.283"). Grips with the same industry-best rigidity and accuracy as our regular collets. Compatible with all Microconic M10 cartridges: F20M10, F25M10 & 5CM10. 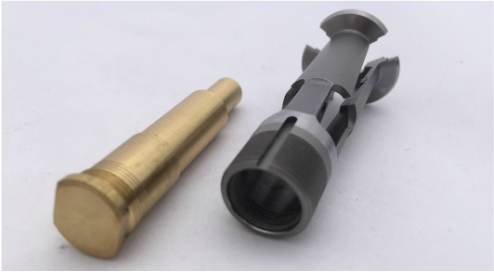 Microguide™ Brass ejection guide sleeve blank is included with each Microconic™ over-grip collet. 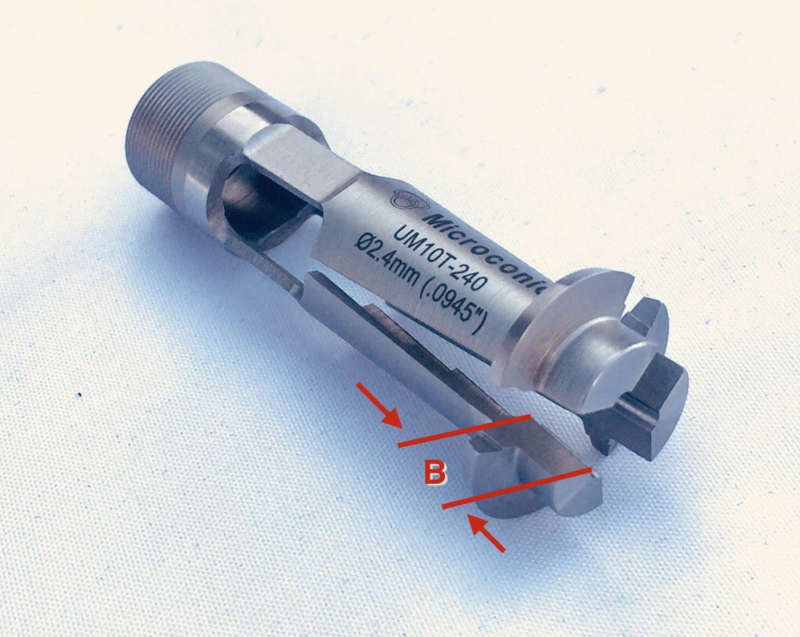 Due to the extreme opening capability of our overgrip collets , workpiece ejection must be very reliable to prevent a part from becoming stuck in the slots of the collet. ​Therefore we have developed the Microguide™ ejection guide sleeve to prevent parts from falling inside the collet instead of ejecting into the part catcher. Download detailed dimensions chart for all over-grip sizes here. Now you can over-grip and do REAL MACHINING in the sub-spindle!